The Senate eliminated the filibuster for Executive and Judicial Branch nominations, so President Trump’s should be zipping to confirmation, correct? Not so fast, actually. As of October 1, the Senate confirmed 172 of President Trump’s Executive Branch nominees, whereas President Barack Obama had 341 and President George W. Bush had 358 for the same period. The difference in the pace of confirmation between the Trump Administration and those of his predecessors becomes even starker when one considers that President Trump is the first first-term President since the Democrats used the nuclear option in 2013 to eliminate the filibuster for Executive Branch and most Judicial Branch nominees. Plus, not all nominees are controversial. For instance, on Wednesday, July 12, the Senate finally confirmed Judge David Nye 100-0. President Obama had originally nominated Judge Nye, and then President Trump renominated him. Yet his nomination still had to go through the long cloture process. Republicans have said it could take 11 years to confirm all the nominees. 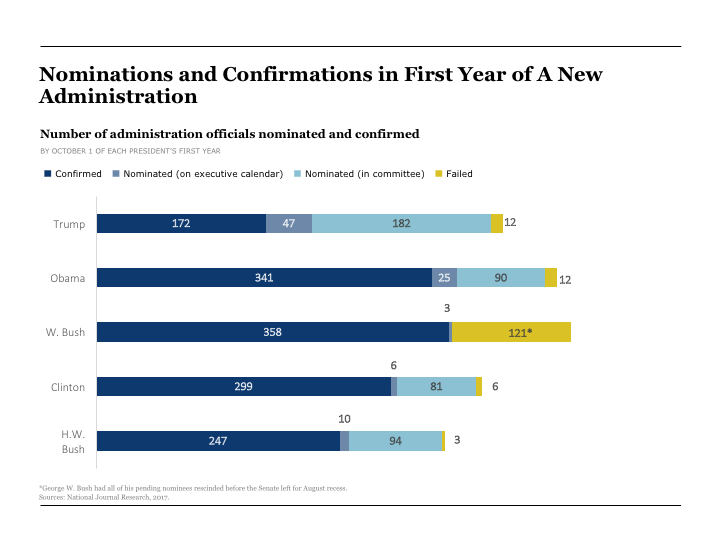 The Senate has sped up confirmations by gutting the filibuster on nominations. However, Senate rule XXII, which governs the process for voting to end debate, allows for 30 hours of consideration after cloture is invoked, meaning Senators may still spend a lot of time talking about something they have (theoretically) been talking about for a long time already. Naturally, 30 additional hours of debate after voting to end debate frustrates the majority, especially since there are, obviously, no amendments to be offered on a confirmation vote. This is especially the case for Republicans today, who say that the Senate Democrats are unnecessarily dragging out debate on Executive Branch nominations. To speed up the process, the Senate could consider a proposal from Senator James Lankford, a Republican from Oklahoma. Earlier this year, he floated among his colleagues the idea of reducing the post-cloture time spent on nominees from 30 hours to 8. The concept of limiting post-cloture debate to eight hours is not new. In 2013, the then-majority Democrats and then-minority Republicans agreed to shorten post-cloture debate on nominations to eight hours. (Top posts, like those for department secretaries, were exempted from this agreement.) The deal also affected legislation by limiting debate on the motion to proceed to four hours and guaranteeing each party the right to offer two amendments if the motion to proceed was adopted. The Senate codified this agreement by adopting a resolution at the beginning of the 113th Congress in 2013. The resolution to change the rules contained a sunset provision, meaning the agreement expired at the end of that Congress. The Senate adopted it in an overwhelmingly bipartisan manner, 78-16, with majorities of both parties favoring it. The Senate is supposed to be the place in the legislative process where political minorities should have their greatest influence. So it raises the question: Is an 8-hour limit to post-cloture debate fair? In 2013, a majority of each party apparently thought so. But this question actually does not have an easy answer. The minority should ask itself what it gains from lengthy post-cloture debate on nominations. The answer seems to be: not much. Each nomination must go through confirmation hearings in committee, where the minority is able to debate and air its views. Then it has the same opportunity to do so when the nomination is debated on the Floor of the Senate. Once a cloture petition is presented to start the process of voting to end debate, the Senate must wait two days before voting on cloture. So, whether the post-cloture debate time is 30 hours or 8, the minority has ample time to speak (provided the Majority Leader has not resorted same-day cloture, a debate-limiting tactic). Once cloture has been invoked, the minority are virtually helpless in stopping the nomination, so their greatest reward from lengthy post-cloture debate is that they consume valuable Senate time. (And in this case, the Wall Street Journal reported that the Democrats have slow-walked the nominations precisely to burn time in protest of what they said was the poor process used to consider Obamacare repeal.) At best, taking the Senate’s time only indirectly protects minority rights, but is better used to garner media coverage and generally makes the majority miserable. The majority then retaliates by clamping down on the minority’s ability to influence the process, which further erodes the minority’s ability to protect its rights. A more interesting question about this rule is how it would be implemented. The Senate could put Senator Lankford’s rule in place by going through the formal process of changing the wording of the rule by adopting a simple resolution. In all likelihood, the Democrats would filibuster this change, since it would disadvantage them. The Senate would need to invoke cloture, which, for a rule change requires 67 votes to succeed (or, technically, “two-thirds of the Senators present and voting”). With only 52 Republicans, amending the Senate rules through a simple resolution probably won’t happen anytime soon. A second way to implement this idea is via the nuclear option, a highly controversial procedure that would allow them to circumvent the supermajority requirement to end debate on rule changes. (We’ve written extensively about it before. For details on how it works, visit “Previewing the Nuclear Option: How the Senate Could Reform the Filibuster”.) Both the Democrats and Republicans have shown how easy and effective the nuclear option is. Given the divisions between the Republicans and Democrats, this might be the most efficient way they can limit post-cloture debate to eight hours. However, the nuclear option is highly controversial and would incite the Democrats to retaliate. Plus, it would be the second time the Senate used the nuclear option in a relatively short period to change a critical rule. We have said that using the nuclear option could lead to a Senate where the rules mean whatever the majority says they mean, despite their plain text. Using the nuclear option to limit post-cloture debate to eight hours would take us even closer to that reality. It would mean that the Senate is evolving into a place where the procedures are used more to conduct the majority’s business efficiently rather than protect the rights of the minority. There is, however, a third way that the Senate Republicans could consider to shorten post-cloture debate on nominations. They could revive the 2013 standing order, which both limited post-cloture debate time on nominations and guaranteed the minority the right to offer amendments on legislation. This compromise would alleviate two-long standing grievances: It would satisfy the Republicans by shortening debate and the Democrats by ensuring they have the opportunity to try and shape legislation by amending it (a right often denied in recent years, regardless of which party controls the Senate). In that respect, it might improve the overall functioning of the Senate. It is unclear, however, if this is a viable option. Would the Democrats see greater political and policy advantages if they were assured a certain number of amendments? Or would they prefer to be able to delay nominations? It is difficult to say. It is also unclear whether Republicans would want to guarantee Democrats a certain number of amendments for each bill, since such amendments could become props in the next campaign. Whichever method is used to adopt Senator Lankford’s idea, Americans would likely appreciate the thought that the Senate is becoming more efficient. Congressional Institute-Winston Group research shows that one of the reasons constituents are frustrated with Congress is that they perceive nothing is getting done in DC. Speeding up nominations—thereby freeing more time for legislation—could be a sign to the public that Congress is responding to their demands for greater activity. At this point, it is not clear how much currency Senator Lankford’s proposal has among his colleagues. As they say, “time will tell.” But maybe not, since we’re talking about the Senate. Nominations might take up too much time. Mark Strand is the President of the Congressional Institute and Timothy Lang is a research director. The Sausage Factory blog is a Congressional Institute project dedicated to explaining parliamentary procedure, Congressional politics, and other issues pertaining to the Legislative Branch.